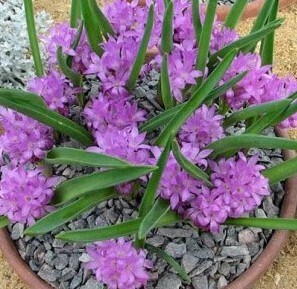 Lachenalia, which belongs to the Hyacinthaceae family, is a genus of bulbous plants from southern Africa. The genus consists of nearly 130 species, most of which are quite short in stature with only a few exceeding 15cm. Many have large, eye-catching and ornamental flowers in an assortment of colours ranging from sea-green or blue to rich red and clear bright pink, often accompanied by attractively marked leaves. A handful of species are found in Namibia, but most are South African endemics with the greatest diversity found in the Western Cape. The genus name Lachenalia commemorates the Swiss botanist Prof. Werner de Lachenal (1739-1800) who was stationed at the University of Basel during the late 18th century. Propagation from seed is easy and straightforward and they are well suited to rockeries and being grown in pots. Lachenalia pauciflora is a South African endemic species from the Western Cape Province where it occurs between Paternoster and Langebaan. It was previously known as Hyacinthus paucifolius, Periboea oliveri, Periboea paucifolia and Polyxena paucifolia. It has two linear to lanceolate suberect channeled leaves and flowers that are pale to deep lilac in color with a tube equal to the segments. It grows on coastal granite and limestone outcrops. This species bears honey scented flowers.